Looking back over the invoice finance funding lines that we have arranged for clients over the last few months, the size of the funding lines put in place ranges quite dramatically. 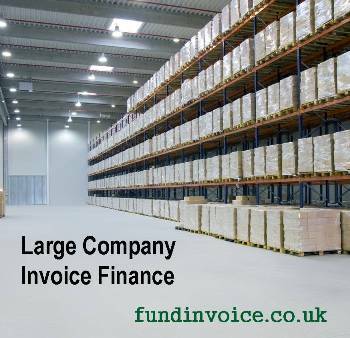 The invoice finance funding lines we have facilitated ranged from just £8K up to £1m, and all points in between. Quite a few have been around the £150K to £200K mark and there have been a few larger lines e.g. £650K. There is no real difference in the way that we handle a small or large customer, the process is similar. The largest company that has ever approached us had an annual turnover of £250M. At the small end we have had clients that have discounted just a few thousand pounds worth of invoices. We would love the opportunity to work with more larger company clients but those invoice finance opportunities often tend to approach either their bank direct, or turn to their accountants which may not be their best option. Whilst these may be obvious routes, and may give you access to a cheap offer - if you are fortunate, it is not always going to give rise to the best offers, highest service levels or the finest pricing. Your bank will of course promote their own invoice financing arm, and our research suggests that most accountants tend to deal with an average of 2 different invoice finance companies, rather than the full market that brokers like ourselves will connect with. Once again, dealing with a narrow number of options may not give rise to the best rates available, or find the most flexible providers that are able to deal with difficult client situations.